It has an uninspiring name yet Muddy Creek forms the deepest canyon in the San Rafael Swell and for many miles flows through a spectacular gorge of colorful sandstone - known as The Chute, the vertical walls here rise for several hundred feet above the streambed, which usually has running water all year. Except after heavy rain the creek is only a few inches deep and the canyon has no great obstacles, just a lot of sticky clayish mud that can make the hike rather tiring especially as the distances are quite large. To see all of the narrowest section requires a walk of 20 miles round trip or 15 miles one way if a car shuttle is available between the upper and lower trailheads, though there are several tributaries also worth exploring and the hike could be extended to a backpacking trip lasting several days. Muddy Creek starts in the hills of the Wasatch Plateau, flows across the southwest corner of the San Rafael Swell into the desert beyond, then joins the Fremont River at Hanksville where it becomes the Dirty Devil River. 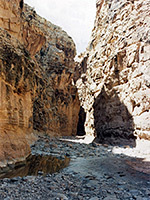 It has carved two impressive canyons though the steeply inclined rocks that form the reef at the eastern and western edges of the Swell but the narrowest part, the Chute, is found in the middle, where the creek cuts a deep, winding path through the resistant Cedar Mesa sandstone layer. This is the same rock that forms the cliffs and buttes around Sedona, and in this and other places on the Colorado Plateau it has created many imposing gorges but they are not usually narrow. 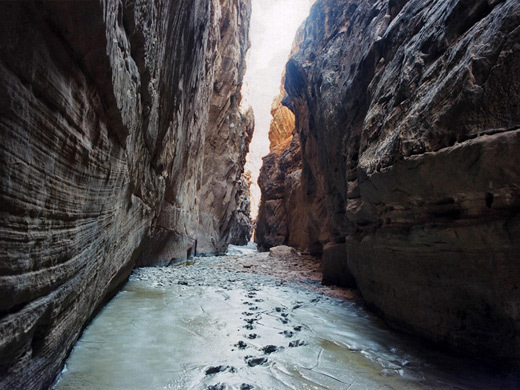 The Muddy Creek drainage system has the best slot canyons in this type of rock. There are two possible starting points for the hike, a few miles either upstream or downstream of the Chute at the only two places where the creek is not cliff-bound and so approachable by road. Both are quite remote and over an hour's drive from a paved highway. Most people use the northerly trailhead at Tomsich Butte, an interesting region with disused uranium mines dating from the 1940s - 1950s. Numerous shafts and tunnels were bored into the deeply colored, angular cliffs and buttes either side of the creek, and various old stone shacks and mining equipment are still scattered over the hillsides. The other option is Hidden Splendor Mine, downstream of the narrows and just inside the southern edge of the reef. This is also an area formerly used for uranium excavation and has cliffs of the same crumbling, multicolored rock from the Moenkopi, Chinle and Wingate strata. 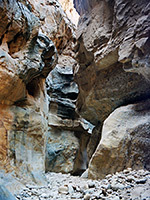 There are other good slot canyons nearby, including Cistern, Ramp and Quandary. Both Muddy Creek trailheads are reached by one of two good gravel roads. The first leaves I-70 at exit 131 (formerly 129) and heads southwest across the flat land at the centre of the swell (Sinbad Country). After 14 miles, at a place called Tan Seep, it meets the other road - the Temple Mountain route that starts from UT 24 and is also used to reach Goblin Valley and the upper end of Crack Canyon. From the junction, an equally good road continues southwest over McKay Flat for 9 miles to another junction. Left is to the Hidden Splendor Mine (start of various hikes including Cistern and Ramp Canyons), a bendy road that descends steadily past red rock scenery to the creek, while right is to Tomsich Butte; steeper in places, this winds down between ridges and tilted strata as the western reef approaches. Most roads in the Swell are well maintained and signposted and any vehicle should be able to reach either trailhead, except perhaps after heavy rainfall. 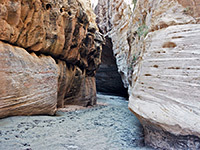 This is one canyon to be explored at only certain times of year; in winter the water is very cold, in spring it can be too deep and some months of summer bring infestations of biting insects. Late summer/fall would seem to be the ideal time, assuming that no thunderstorms are forecast. 13 views of Muddy Creek. TopoQuest topographic map of Muddy Creek. This description is from the Tomsich Butte trailhead. The main approach road bends north in front of the butte - a towering block of Wingate sandstone - while a side track forks left and heads towards the mud flats beside the creek itself, which at this point winds through a wide valley filled by bushes and tamaracks, and with great cliffs forming a backdrop to the west; a slightly eerie place with a distinct sense of isolation, very hot and airless in mid summer. Vehicles can be driven a little way south, until the creek curves across the valley and then the hike begins, initially either beside the stream bed or along a faint, disused mining track over the dusty flats at the west side. 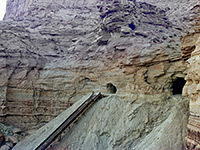 There are other old tunnels in the cliffs above, and also of note is the angular opening of Hondu Arch, 1,500 feet higher up at the top of the Wingate cliffs. Low hills rise to the east of the creek and a small plateau appears on the other side. Maps show an old road to the west that would bypass some of the bends in the early, shallow section of the canyon but this is not easy to follow and involves several steep climbs and descents so the best plan is to stay close to the stream. This has several wide bends with sandbanks at either side, then passes a small tributary (Penitentiary Canyon) and deepens only slowly. Low, crumbling, disorderly cliffs line the main canyon which remains quite wide. For the first hour, the hike is along well worn paths through the sandy areas, and occasional stream crossings. Next the creek starts to cut into the Coconino layer, flows over some plateaus and rock pools, rounds a few tight bends and enters a straight section of good narrows where for the first time the waters cover all of the canyon floor. Beneath the water is a mixture of soft mud and cobblestones, plus occasional deep pools. 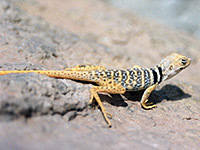 A walking stick is recommended to probe the way ahead. 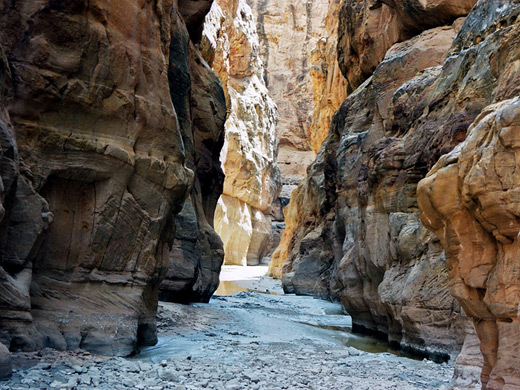 The first narrows gradually open out as the cliffs drop and the stream passes what may be an abandoned meander on the west side; here the creek bends almost 180° and becomes quite wide again, enclosed by weathered dusty hills rather than cliffs, and not too interesting. But not for long as after more twists and turns the vertical Coconino walls reappear and deepening begins again; the creek has a long straight section southwest, a bend back east then enters the narrowest, darkest section of all - the middle of the Chute. The start is marked by a very tight tributary on the east side (known as Music Canyon), worth following for a while. 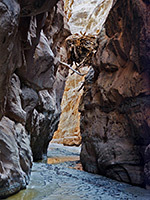 This slot canyon contains interlinked potholes, pools and small dryfalls, all surrounded by nicely textured rock with curvy formations, and the upper parts (above several unclimbable dryfalls) may be explored via a hike from the Hidden Splendor road. The next 3 miles of Muddy Creek are the best, an excellent deep shaded canyon with colorful walls, much closer together than before. Even in the driest periods when the creek stops flowing, in places there will still be standing water up to a foot deep; after rain this may be 4-5 feet. One overhanging alcove has a seep in the rocks above from which drips nice tasting water, a useful place to replenish supplies. Around another corner, and high above the streambed, is a log jam that seems now to be a semi-permanent feature, left by a huge flood many years ago. The canyon begins to widen after the next few bends and for those on round trip hikes this is a sensible point to turn back, 10 miles from the trailhead; the complete journey takes at least 7 hours. Chimney Canyon joins about 4 miles downstream of the log jam - this is a large tributary that branches several times in its upper reaches and has much unspoilt scenery. Past this junction the walls continue to recede and after a further 3 miles the canyon approaches the inside of the southern San Rafael Reef. The exit trailhead at the Hidden Splendor Mine is reached by a short walk uphill.